Better Angels is an episode written by Frank Military which means there are high expectations to be taken on an intensely dark emotional roller coaster of a ride and to be left a quivering wreck. Sometimes it is good to break the mould and do something a little different. After all Military wrote the highly amusing Black Budget and Allegiance which contrasts with his other episodes about child suicide bombers, the capture and torture of agents and sick serial killers sewing together body parts. This offering hits the mark (and then some) when it comes to the emotional aspect but unfortunately the progression of the narrative doesn’t quite sit right. The episode commences with the pursuit of a man Syrian David Sarraf, who ends up pinned against a wall, after the bad guys drive their SUV at speed, directly at him. Sarraf was due to hand over evidence of chemical weapons used on children to the Global Criminal Tribunal, in the shape of recurring character Alex Elmslie. Unfortunately for Sarraf, his lower body is crushed and the pressure of the SUV prevents blood loss, thus keeping him alive until the moment the car is moved. Such a scenario is not a new narrative device (M Night Shyamalan used this in the Mel Gibson film Signs) and unless the person pinned is evil, is always going to be heartbreaking. How heartbreaking, is primarily down to the actors concerned and their impact can be heightened by other aspects of the plot. In Better Angels, the desperation to find Sarraf’s wife in Damascus so they can speak one last time, is juxtaposed with the more frantic action scenes, most noticeably as the episode reaches its climax. Much of this did work, however there were a few issues that meant Frank Military didn’t quite reach the bar on this occasion. The joy of an ensemble cast is that different characters and partners can carry different aspect and different episodes of a season. 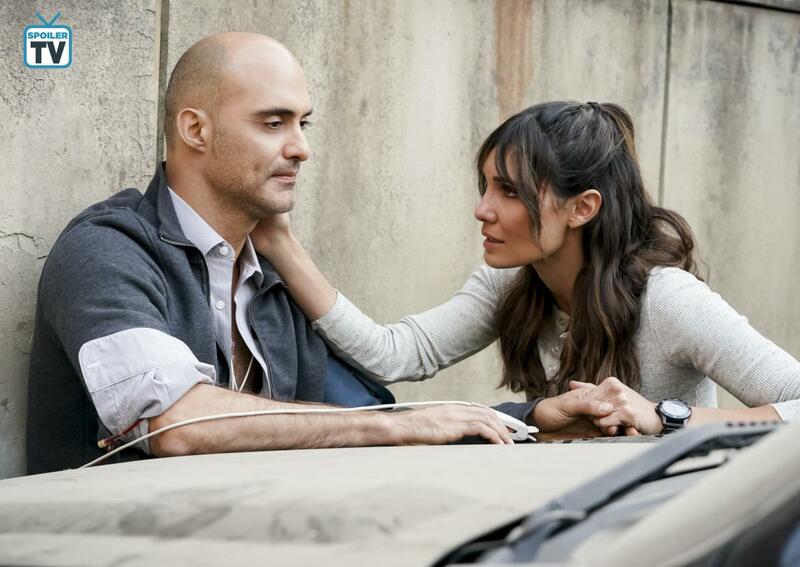 Better Angels saw Kensi forefront when Sarraf asks her to stay with him (how could anyone refuse such a request). Deeks initially accompanies Sam and Callen but is soon siphoned off to keep Arlo Turk company. Callen and Sam have lesser roles this week and after the initial issue on where they are (there is no mission giving in ops, they appear at the hotel from nowhere), their supporting role allows the character and situational development of David Sarraf with Kensi and Deeks and Turk. It does seem that Deeks' gun fight and Turk's fist fight meant there was no time to see Deeks calling the others for back up. Again this meant the pair appeared out of the blue to save Deeks. It's a strength of the ensemble cast and the show during some episodes the character focus can change. Unfortunately it is the lack of explanation as to where they are when they are usually so prominent, which is both curious and disappointing. NCIS Special Agent Arlo Turk has been an interesting character since his introduction in Mexico. His methods and motives have always been somewhat questionable and he has fallen down on the side of the good. Again, Turk is again a loose cannon, a one man band (maybe a version of Callen, were Callen to have much less self control or the familial of his team). Generally he fits in well with the team, bringing some acerbic humour and some friction, mostly with Callen. To say Turk is not a team player is an understatement. He leaves Deeks to fend off at least three gun men when he was cornered while he pursues lead bad guy, Syrian General Joram Nasar. This is after he earlier tipped off the DSS to say NCIS were holding a man with diplomatic immunity, just so he would be released and he could exact his revenge, which he blatantly admitted to Deeks. Nasar is on the thumb drive he stole from Sarraf, killing children with chemical weapons, and he brutally killed Turk’s partner some years previous. While Deeks is cornered and out of bullets, Turk repeatedly punches Nasar, almost strangling him. Turk has strangely worked his way into the team’s affections (he did save their lives...). Callen still doesn't trust him, yet still says he did good when Turk shows Nasar, half beaten to death, slumped in the lift. This is contradictory to the team’s reaction when Mosley (again written by Military in A Line in the Sand), beats the bad guy. She is threatened by the team for her actions, yet there are no such comments about Turk. Why? Unfortunately, Turk is not drawn as a particularly likeable man in Better Angels which means it is difficult to find empathy in his motivations or his actions. There is not the solid narrative that has been such a selling point of Frank Military’s many other episodes (think of the nukes episodes in season four, as well as the S4 finale Descent, the S5 premier Ascension, S3 Crimeleon, S6 Rage, S9 The Silo). Maybe there was too much to pack in and elements of scenes were cut in favour of the extended and violent shots of Turk smacking Nasar? In theory, the action should have made the quiet, intense and desperate scenes between Kensi and Sarraf even more moving. But these emotional scenes made themselves. They were not about the relationship between Kensi and Deeks, although it clearly showed how far they have developed as individuals and as a couple. It is about love and the meaning of life, perfectly demonstrated through Sarraf. The quality of his acting, together of course with Kensi’s reactions, are outstanding. He brings a quiet strength, a goodness and through his sincerity and his dire situation and imminent death, empathy is built. The ending brings so many tears, again affirming that love which David has with his family, which is the most important part of living, whether or not the evidence of Nasar’s guilt is retrieved. Reality is suspended. For the intensity of emotions, who cares whether Sarraf would really have survived for so many hours. Kensi’s reactions of course play a crucial part. The empathy and relationship she builds is reflected in the viewers. There is a question of how much manipulation was at play to ensure actress Daniela Ruah had the emotional connection throughout her scenes. Her husband’s name is David, and their son’s name is River. David Sarraf’s son was named Surray, which means River. Regardless, it worked and the emotional aspect to this episode trumped the frustrations with the plot and the characterisation of Turk. Sarraf: Whether you recovered the drive or not. And the meaning was our love, my love for my son, My father and my mother. Those are the precious gifts. And even if I didn't have them for as long as I'd hoped I had them. That's the important thing. I lived, I loved, and I was loved. What more can I ask from life? Kensi: Not much more than that. David? Sarraf: I'm ready. I'm ready.